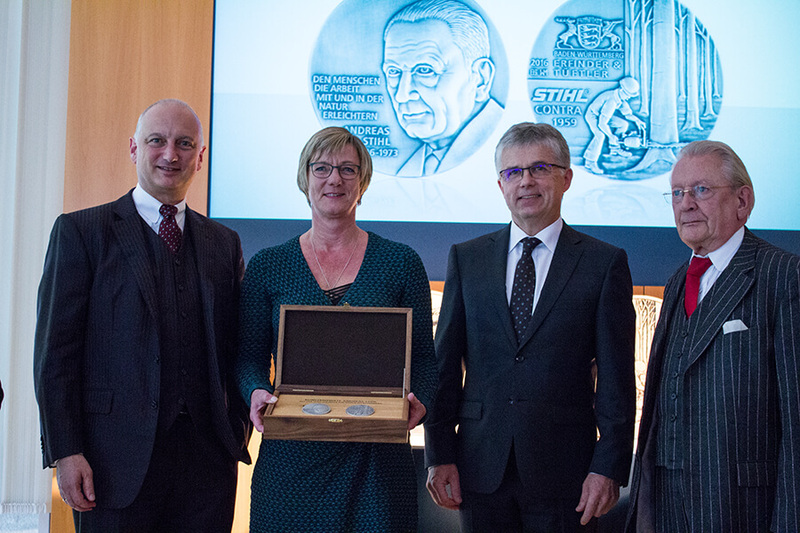 On Wednesday 26 October, Finance Minister Edith Sitzmann presented the latest art medal from the series “Inventors from Baden-Wuerttemberg” in Waiblingen, together with the Head of the State Mint of Baden-Wuerttemberg, Peter Huber. The art medal is dedicated to Andreas Stihl, “Father of the Chainsaw”. “Our intention behind the art medal series “Inventors from Baden-Wuerttemberg” is to honour people in our state who, with their spirits of ingenuity and creativity, have advanced technical progress in particular. It is this innovative spirit that has made Baden-Wuerttemberg such a highly productive state”, said Finance Minister Edith Sitzmann at the presentation ceremony of the art medal at the Stihl company. Since 2007, the State Mint of Baden-Wuerttemberg has issued an art medal series, which commemorates the most outstanding inventors in the state of tinkerers and thinkers. The Andreas Stihl medal is the tenth in the series to be issued by the State Mint. Inventors already honoured include Artur Fischer, Graf Zeppelin, Karl Maybach, Karl Drais, Carl Benz and Gottlieb Daimler, Margarete Steiff, Heinrich Hertz, Ferdinand and Ferry Porsche as well as Alfred Kärcher. Dr Nikolas Stihl, STIHL supervisory and advisory board chairman, stated at the presentation of the medal: “It is a great honour for us to receive the Andreas Stihl medal. We are proud that his lifework has been recognised in this way.” In 1926 then 30 years old Andreas Stihl founded his own engineering office in Stuttgart. In keeping with his motto of “making people’s work in and with nature easier”, the chainsaws became lighter and more efficient. Soon enough the workshop became too small and the company turned into an impressive engineering factory: first in Bad Cannstatt and later in Waiblingen, where the company is still headquartered today. Stihl develops and manufactures power tools for forestry and agriculture, garden and landscape maintenance, the construction sector and the demanding private user. Stihl sells its products worldwide in around 160 countries. This year, the company celebrates its 90th anniversary.